Please complete our online PVC strip enquiry form or contact us directly to discuss your requirement and for a price. Our agricultural PVC strip curtain kits are manufactured to order to suit the varying requirements of the agricultural & farming sector. We manufacture strip curtains to order quickly and specialise in manufacturing, heavy duty, long lasting PVC curtains that are designed to withstand the demands of agricultural use. Whether you are looking to cover poultry sheds with blackout curtains, dairy sheds, animal barns or stables with weather protectors, separate and contain areas within your abattoirs or to cover storage facilities with PVC screens, we can advise on the correct PVC strip curtain for every application. We also recommend PVC strip for strength liners on pig troughs and silos. 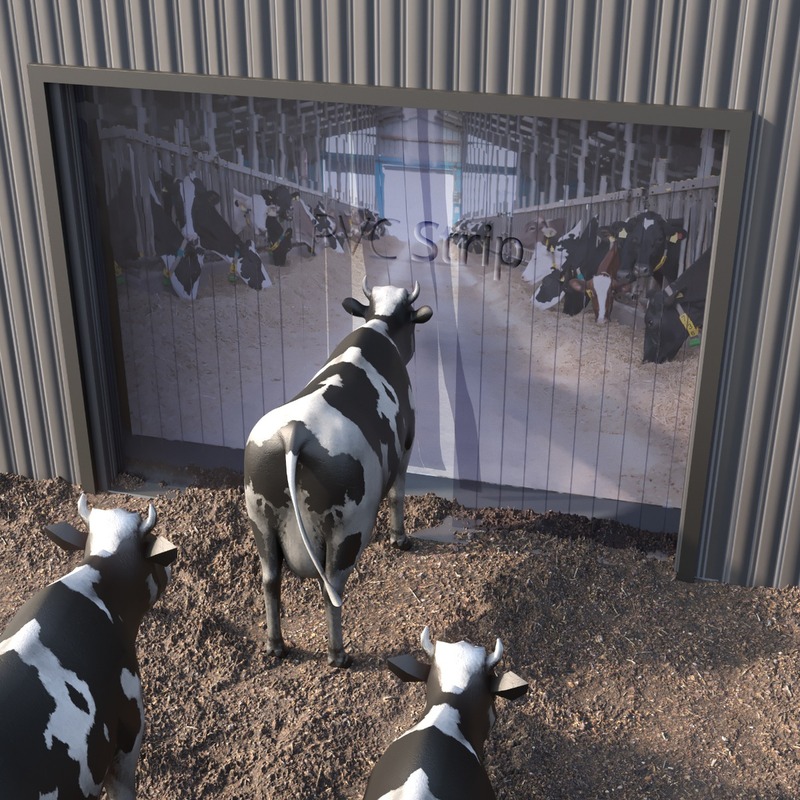 The DK range of plastic strip doors for the agricultural market is an economical solution to covering all your openings where ease of access, temperature, weather and light control are a major concern. We use heavy duty PVC strip (ribbed or flat grades) and black PVC strip for poultry barns. We utilise PVC strip of various widths and thickness to ensure we can load the appropriate weight into your product. We have a range of suspension systems to suit your requirement and as we are a supply only company, you can find all our installation guides in our information centre. Plastic strip door kits for agricultural use are manufactured to order and we need to understand your exact requirements before we can provide a quotation. Grade of PVC required – are there any colour or specific performance requirements? Plastic strip doors will get dirty and should occasionally be wiped down with warm, soapy water. Do not use chemicals to clean this product as they can react and cause clouding of the PVC. Ensure they are left hanging vertically when you wipe the strips down, if PVC is left in water it can cloud over time.